Enjoy savings up to 70% off on selected items in SM City Cebu's Simply Irresistible Sale. Shoppers can get a chance of winning 1 of the 10 Devant LEDTech LCD TVs. It is time to design, create, and accessorize your favorite flip-flops. Cosplay Alodia will be there to meet and greet you when fantasy turns to reality. 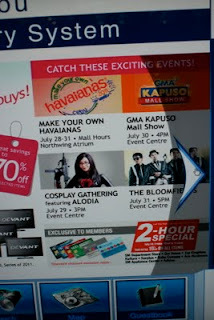 If you wanna dress up, join Alodia and have a swell. Tween Stars Barbie Forteza, Joshua Dionisio, Joyce Ching, and Kristoffer Martin will be there entertain the shoppers. An afternoon of good music awaits the shoppers.